Oil and Cotton: Oil and Cotton at the Trans-Pecos Music Festival! Oil and Cotton at the Trans-Pecos Music Festival! Oil and Cotton will be out in West Texas celebrating the culture of the Southwest by creating miniature woven altars at the Trans-Pecos Music Festival in Marfa,Texas. Students will learn how to transform a simple box into a functioning loom and weave a space for memory. 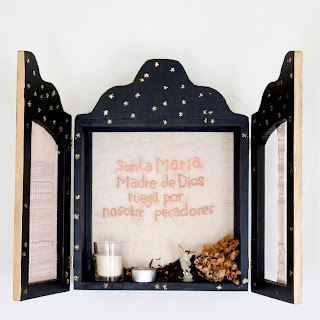 Utilize an assemblage of materials such as textiles, paper, photos, and cherished treasures to construct meaning within your own personal shrine. Found objects such as grasses, yucca pods, cactus needles, and tumble weeds will be incorporated into your altar so you can take a little piece of West Texas home with you. Participants will explore the process of creating layers with simple woven structures and collage natural and man made materials. Folks are welcomed to bring any items or images they would like to incorporate into their shrine or choose from an array of provided materials. Visit www.sunbeamoperations.sqsp.com to learn more about the instructor, Sarah Westrup. Click here to see the full Trans-Pecos Music Festival workshop listing.